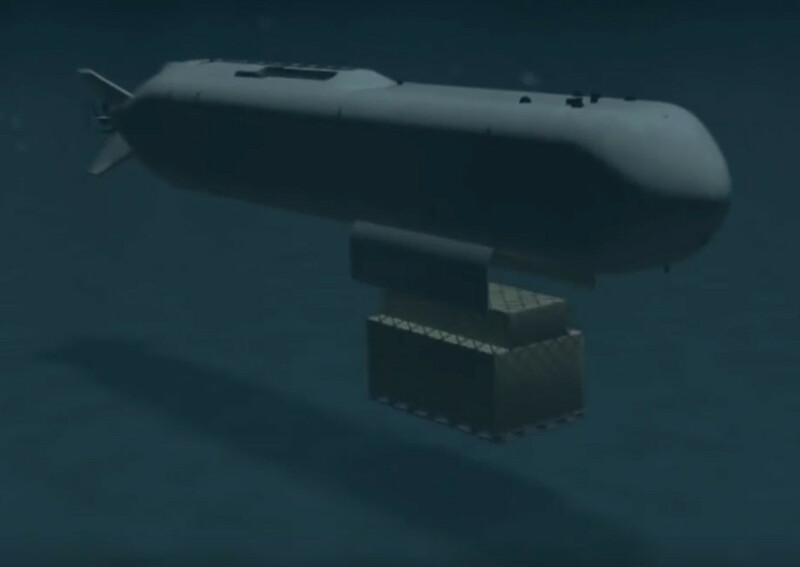 The US Navy is progressing towards the aim of having extra-large unmanned underwater vehicles (XLUUVs) armed with cruise missiles, torpedoes, mines and smaller UUVs. The current stage is the construction of four Orca XLUUVs. 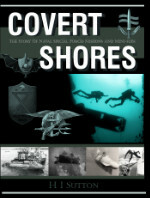 The Orcas will be unarmed but will ultimately pave the way for armed XLUUVs. 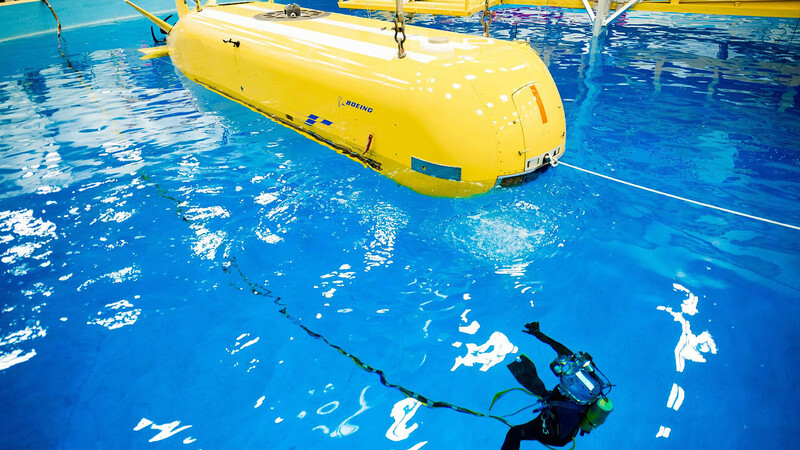 These systems would complement larger nuclear-powered attack submarines and other anti-submarine platforms and potentially revolutionize undersea warfare. Orca will keep the US at the forefront of XLUUV technology, although Russia, China and Japan are also working on XLUUV projects. On 13th February 2019 the US announced that it had awarded Boeing the contract to build four Orcas. 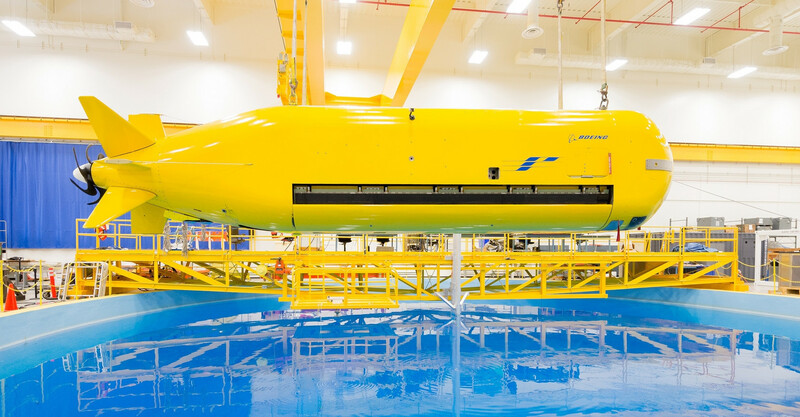 Boeing has partnered with Huntington Ingall, beating off competition from Lockheed Martin. The Orca will be the first XLUUV class. Lockheed Martin has received $43.2 million and Boeing $42.3 million to compete in the design phase. Orca is a two-phase competition with the design phase followed by a competitive production phase of up to nine vehicles starting in 2019. The Orca which is a stepping stone towards armed XLUUVs. 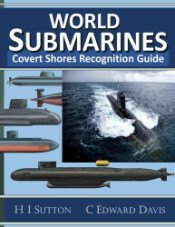 The Orca Class will help develop the Concept of Operations (CONOPS) as well as furthering payload integration and adding mine warfare to the operational repertoire. The future XLUUV will operate across a broad range of roles. 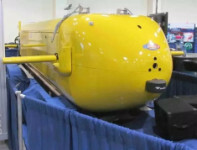 To do this, they will ultimately be armed with up to twelve heavyweight tubes which could carry torpedoes for anti-submarine warfare (possibly including countering the Poseidon Intercontinental Nuclear-Powered Nuclear-Armed Autonomous Torpedo) and anti-ship strike, and/or cruise missiles for land attack. 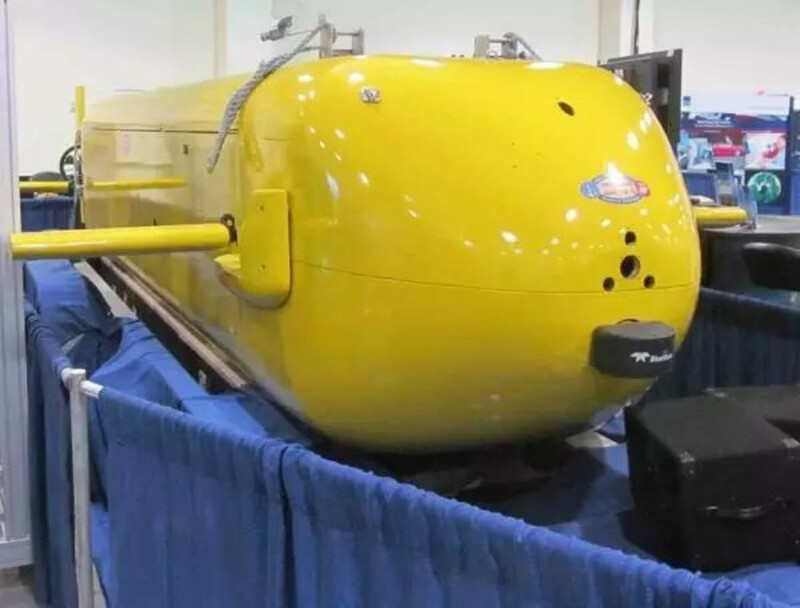 They will also carry large UUVs, sow mines, perform ISR (Intelligence, Surveillance and Reconnaissance), and mine countermeasures (MCM). 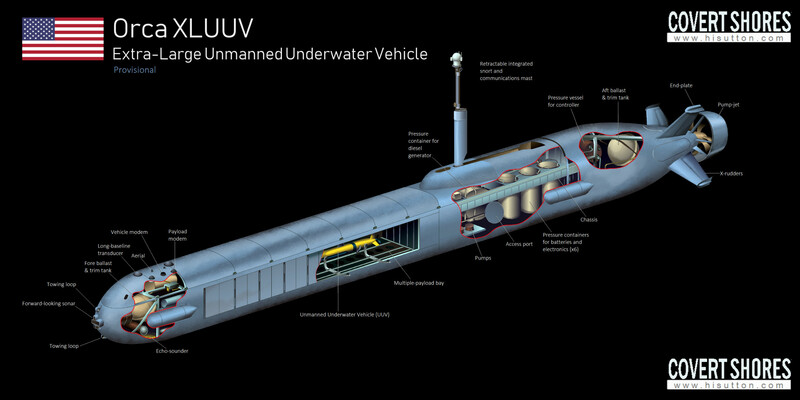 Generic illustration of Future XLUUV based on US Navy artwork. Although no specifications are available, one graphic used by the US Navy to represent an armed future XLUUV is particularly revealing. It shows a craft with generally the same layout as the interim Orca class, with a payload module with bomb-bay like doors along the bottom. The payload bay contains three rows of four heavyweight torpedo tubes angled to fire down through the bomb bay doors. 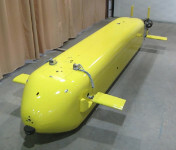 This makes the length of the payload bay about 10 meters, giving an indication of the overall size. 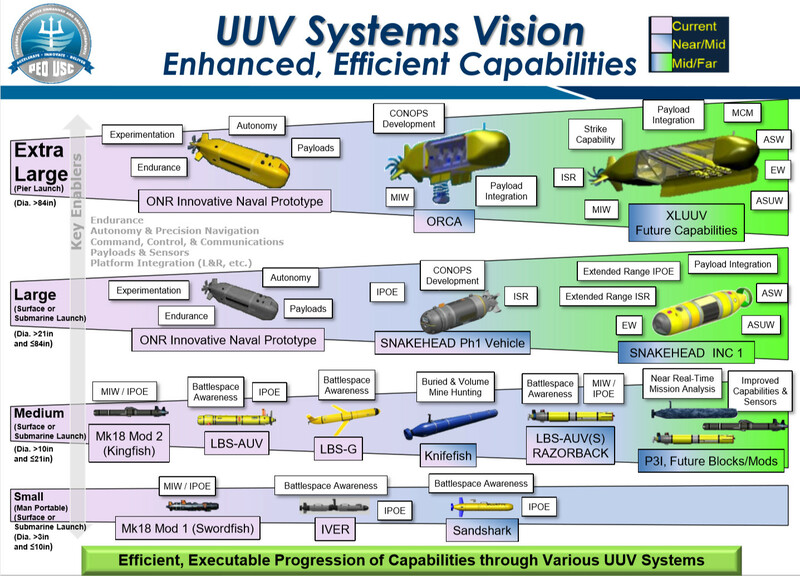 US Navy graphic showing XLUUV concepts. The left is from Boeing, and the right from Lockheed Martin. 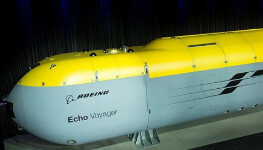 Boeing have previously been building a series of experimental large displacement UUVs (LDUUVs) for around a decade with the Echo series. 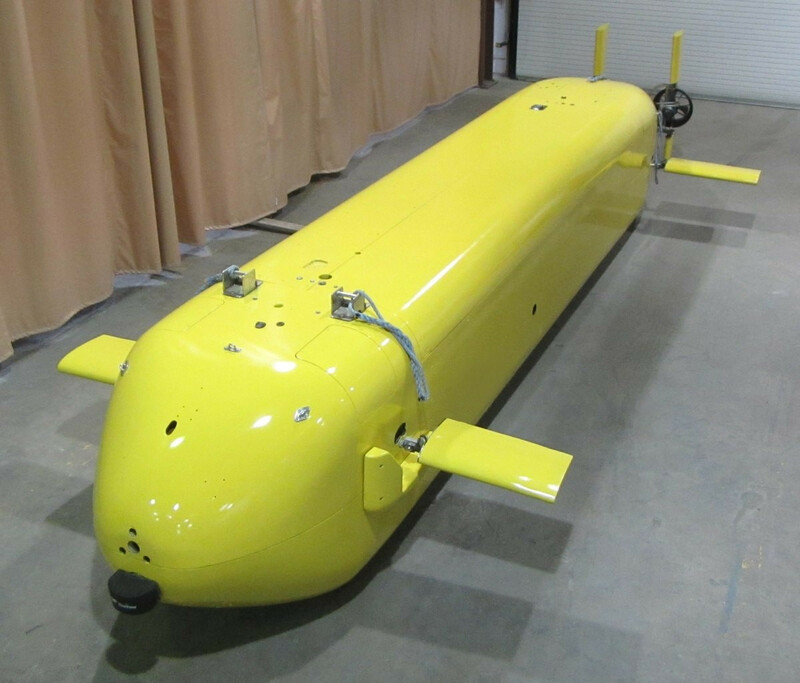 Several have been tested by the US Navy to aid UUV research, leading to Boeing’s funding for the Orca program. 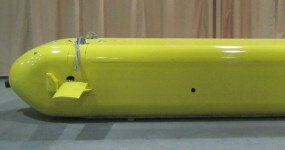 The largest of the series, the privately funded Echo-Voyager, is in a different league to existing UUVs, being 25 meters long with 8 ton payload compartment hull insert. 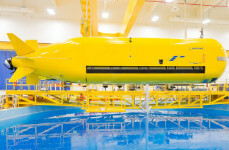 It is almost certainly the largest UUV in the world, certainly publicly known. Boeing graphic of Echo Voyager with payload hull section. Lockheed Martin's design was more torpedo-like. The LM Orca design will be modular with an open architecture to allow multiple payload configurations.